The inside is lined with some waterproof coating. I can't tell if it is wax or plastic. "Please recycle this container", it says. Would it be OK to recycle it as paper along with the usual curbside recycling? Or should I treat it like a Tetra Pak container? Or maybe I could toss it in the city compost? 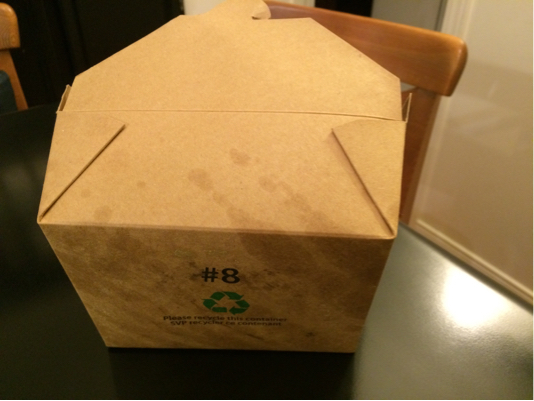 Since there is no such thing as #8, #81 composite paper/plastic can only be recycled by separating the plastic from the paper, and in the U.S., many recycling companies accept this material, but I was unable to find out the method that they use, if they even use one. However, Canada may have different regulations, and I would doubt that the material is accepted for recycling.